The design characteristics of plastic and non-metallic bearings bear both similarities and differences relative to those of porous-metal bearings. This will now be described in greater detail. Plastics (such as acetal, nylon, PTFE), carbon graphite and other non-metallic materials have been increasingly used as self-lubricating bearings. Their composition has been refined over many years so as to obtain favorable bearing characteristics. These include low friction, corrosion resistance, ability to conform under load (plastic bearings), ability to function over substantial temperature ranges and substaintial load-carrying capability. Although temperature ranges, dimensional stability and load limitations of plastic gears are in general less than for metallic bearings, plastic bearings are remarkably versatile and economical. Phenolics: Composite materials consisting of cotton fabric, asbestos, or other fillers bonded with phenolic resin. The good compatibility of the phenolics makes them easily lubricated by various fluids. They have replaced wood bearings and metals in such applications as propeller and rubber-shaft bearings in ships, and electrical switch-gear, rolling-mill, and water-turbine bearings. In small instruments and clock motors, laminated phenolics serve as structural members as well as a bearing material. They have excellent strength and shock resistance, coupled with resistance to water, acid, and alkali solutions. Some precautions must be observed with phenolic bearings. Thermal conductivity is low, so heat generated by bearing friction cannot readily be transmitted through the bearing liner. Consequently, larger, heavily loaded bearings must have a generous feed of water or lubricating oil to carry away heat. Some swelling and wraping of these bearings occurs in the larger sizes, so larger-than-normal shaft clearances are required. Nylon: Although the phenolics have predominated in heavy-duty applications, they are frequently replaced by nylon, which has the widest use in bearings. Nylon bushings exhibit low friction and require no lubrication. Nylon is quiet in operation, resists abrasion, wears at a low rate, and is easily molded, cast, or machined to close tolerances. Possible problems with cold flow at high loads can be minimized by using a thin liner of the material in a well-supported metal sleeve. Improvement in mechanical properties, rigidity, and wear resistance is obtained by adding fillers such as graphite and molybdenum disulfide to nylon. While the maximum recommended continuous service temperature for ordinary nylon is 170°F, and 250°F for heat-stabilized compositions, filled-nylon parts resist distortion at temperatures up to 300° F.
PTFE: has an exceptionally low coefficient of friction and high self-lubricating characteristics, resistance to attack by almost any chemical, and an ability to operate under a wide temperature range. High cost combined with low load capacity has frequently caused PTFE resin to be selected only in some modified form. PTFE is used as a bearing material in automotive knuckle and ball joints, chemical and food processing equipment, aircraft accessories, textile machinery, and business machines. Although unmodified PTFE can be used to a PV valueof only 1,000, PTFE filled with glass fiber, graphite, or other insert materials, can be used at PV values up to 10,000 or more. In general, higher PV values can be used with PTFE bearings at low speeds where coefficient of friction may be as low as 0.05 to 0.1. One bearing material combines the low friction and good wear resistance of lead-filled PTFE with the stength and thermal conductivity of a bronze and steel supporting structure. A plated steel backing is covered with a thin layer of sintered, spherical, bronze particles. The porous bronze is then impregnated with a mixture of PTFE and lead to provide a thin surface layer. Service temperatures of -330° to +536°F are possible. Woven PTFE fabrics are often readily handled and applied. With their resistance to cold flow, they are used as bearings in a wide variety of high-load applications as automotive thrust washers, ball-and-socket joints, aircraft controls and accessories, bridge bearings, and electrical switch gear. To provide a strong bond to either steel or other rigid backing material, a secondary fiber such as polyester, cotton, or glass is commonly interwoven with PTFE. The woven fabric then is bonded to steel backing. Improved versions of this type of bearing have woven or braided "socks" (of PTFE and a bondable material). The bearing sleeve is then filament wound with a fiberglass-epoxy shell. These bearings have been reported to carry dynamic loads as high as 50,000 psi. 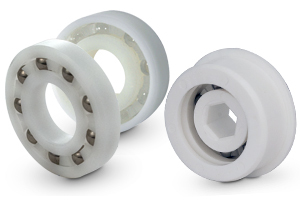 Acetal: Has been used for inexpensive bearings in a wide variety of automotive, appliance, and industrial applications. It is particularly useful in wet environments because of its stability and resistance to wet abrasion. Polyimide, Polysulfone, Polyphenylene: High-temperature materials with excellent resistance to both chemical attack and burning. With suitable fillers, these moldable plastics are useful for PV factors to 20,000 and 30,000. Polyimide molding compounds employing graphite as a self-lubricating filler show promise in bearing, seal, and piston ring applications at temperatures to 500° F. Polyphenylene sulfide can be applied as a coating through use of a slurry spray, dry powder, or fluidized bed. The coating techniques require a final bake at about 700 °F. Ultrahigh-Molecular-Weight Polyethylene: Resists abrasion and has a smooth, low-friction surface. Often an ideal material for parts commonly made from acetal, nylon, or PTFE materials. Carbon-Graphite: The self-lubricating properties of carbon bearings, their stability at temperatures up to 750° F, and their resistance to attack by chemicals and solvents, give them important advantages in fields where other bearing materials are unsatisfactory. Carbon-graphite bearings are used where contamination by oil or grease is undesirable, as in textile machinery, food handling machinery, and pharamaceutical processing equipment. They are used as bearings in and around ovens, furnaces, boilers, and jet engines where temperatures are too high for conventional lubricants. They are also used with low-viscosity and corrosive liquids in such applications as metering devices or pumps for gasoline, kerosene, hot and cold-water, sea water, chemical process streams, acids, alkalis, and solvents. The composition and processing used with carbon bearings can be varied to provide characteristics required for particular applications. Carbon-graphite has 5% to 20% porosity. These pores can be filled with a phenolic or expoy resin for improved strength and hardness, or with oil or metals (such as silver, copper, bronze, cadmium, or babbitt) to improve compatibility properties. A PV limit of 15,000 ordinarily can be used for dry operation of carbon bearings. This should be reduced for contionuous running with a steady load over a long period of time to avoid excessive wear. When operating with liquids which permit the development of a supporting fluid film, much higher PV values can be used. A hard, rust-resistant shaft with at least a 10-µin. finish should be used. Hardened tool steel or chrome plate is recommended for heavy loads and high-speed applications. Steel having a hardness over Rockwell C50, bronzes, 18-8 stainless steels, and various carbides and ceramics also can be used. Certain precautions should be observed in applying carbon-graphite. Since this material is brittle, it is chipped or cracked easily if struck on an edge or a corner, or if subjected to high thermal, tensile, or bending stresses. Edges should be relived with a chamfer. Sharp corners, thin sections, keyways, and blind holes should be avoided wherever possible. Because of the brittleness and low coefficient of expansion (about ¼ that of steel), carbon-graphite bearings are often shrunk into a steel sleeve. This minimizes changes in shaft clearance with temperature variations and provides mechanical support for carbon-graphite elements. The comparative properties of three proprietary materials are summarized in Table 1. Max. V * 1700 ft/min. 400 ft/min. unlubricated applications (tw)10-4 + 0.004"
(iii) "Rulon® Standard Stock Bearings, Engineering Manual, Cat. 75", Dixon Corp., Div. of Dixon Industries, Bristol, R.I., 02809. Class I - Grease applied externally prior to start-up. Class II - No grease applied prior to start-up. 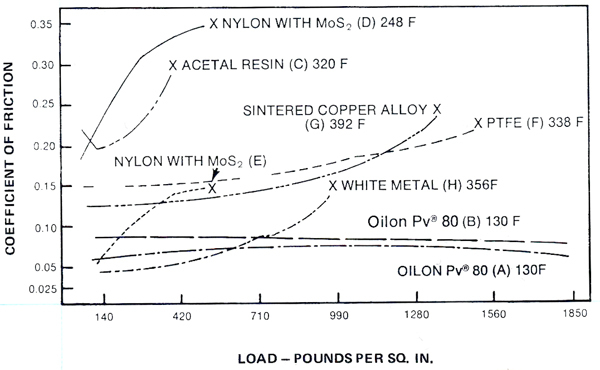 A comparision of frictional characteristics of various metallic and plastic materials is given in Figure 1. In some plastic materials the coefficient of friction decreases with load, thereby greatly reducing or eliminating the stick-slip problem in the start-up of machinery. In recent years the properties of plastic bearing materials have been materially enhanced by the addition of fillers (such as fiber, powder, graphite and molybdenum disulfide) and composites (metal or other backings). If the cost is warranted the mechanical properties of such bearings can dramatically improved. * Reproduced with the permission of TFE Industries, 148 Parkway, Kalamazoo, Michigan, 49006, from "OILON Pv® 80 Design Guide", p.5. The load-carrying capacity of plastic and non-metallic bearings is determined by means of the PV-factor, as described in the section on porous-metal bearings. The upper bound or limiting value of the PV factor again depends on operating conditions (speed temperature, etc.) and a limit on the allowable unit loading. In addition to its use as a design guide for limiting load/speed values the PV factor can also be used to estimate a relative wear factor, K.
Table 2 summarizes data for the PV and K factors for typical and non-metallic bearing materials. The PV factor, used as a load-speed limit also provides a basis for estimating relative wear rates. The total volume of material worn away is approximately proportional to the total normal load multiplied by the distance traveled in a length of time. Thus, R = K(PV)T, where R3 = radial wear in a sleeve bearing. in. ; K = wear factor in. 3 -min/ft-lb-h; P load, psi; V = surface velocity, fpm; T=time, h.
This equation does not always provide accurate absolute values for wear rate, but it is useful for estimating relative wear rates for alternative materials. In general, K wear values with fillers are lower than for unfilled materials. If wear values are important for specific components, life tests should be made. These might employ moderately accelerated load and speed conditions to obtain a K value representative of the plastic, the shaft and its finish, and the application conditions. K values should be increased by 50% for cast iron and bronze shafts, and more than 5 times with soft stainless steel or aluminum alloys. Increased surface hardness can markedly reduce wear, while surface roughness of the shaft often has an optimum value in the 4-14 µin. rms range. Lubrication also has a pronounced influence on wear. With oil impregnation, wear rates commonly drop to negligible values with plastics, wood, and porous metals. For 40 psi load at 2,000 PV operating against carbon steel of hardness 20 Ro with a 6-12 microm finish. A more detailed treatment of the PV-curve for any particular material involves additional data, which can often be obtained from the material manufacturer. For example, in the case of Oilon Pv® - 80, Figure 2 presents such additional information. 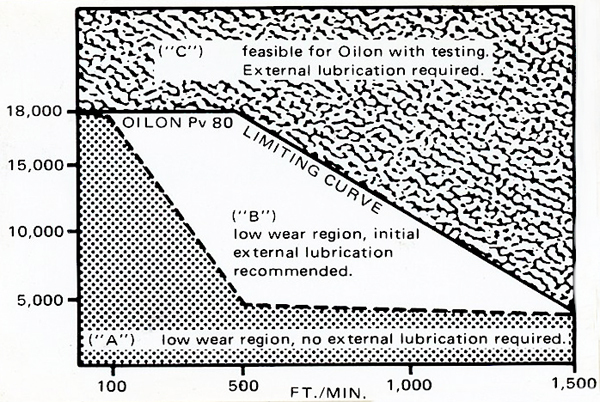 ("A") - low wear region, no external lubrication required. ("B") - low wear region, intial external lubrication recommended. ("C") - feasible for Oilon with testing. External lubrication required. Plastic and non-metallic bearings are widely used in appliances, toys, general machinery and applications ranging from cameras and toys to office machinery and automobiles. When properly designed their light weight and economy can be highly attractive. * Reproduced with the permission of TFE Industries, 148 Parkway, Kalamazoo, Michigan, 49006, from P.7 of "Oilon Pv® -80 Design Guide".